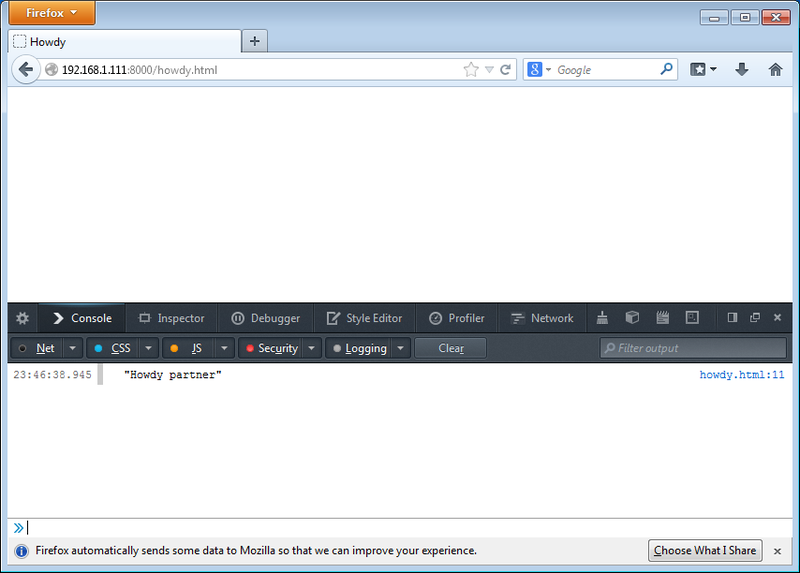 With every browser, you’ll use a slightly different way of accessing and using the developer console. 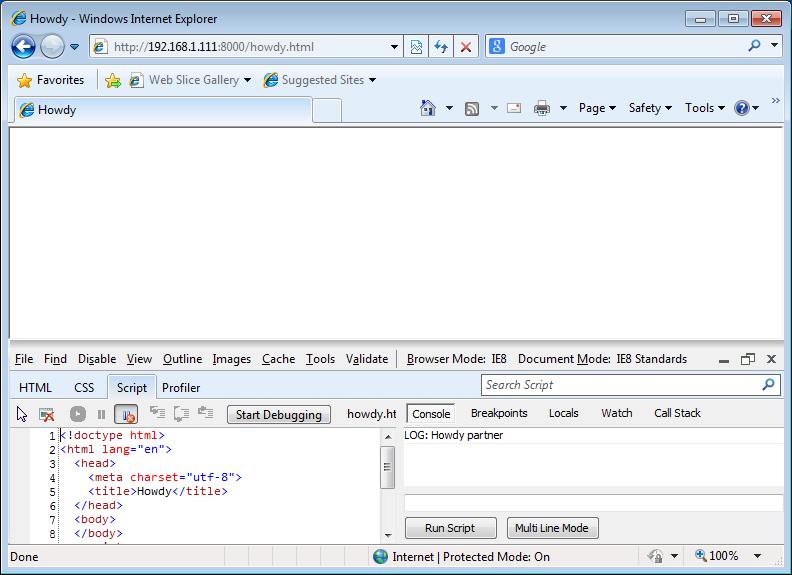 Not only that, but the browsers change the implementation of the console occasionally. 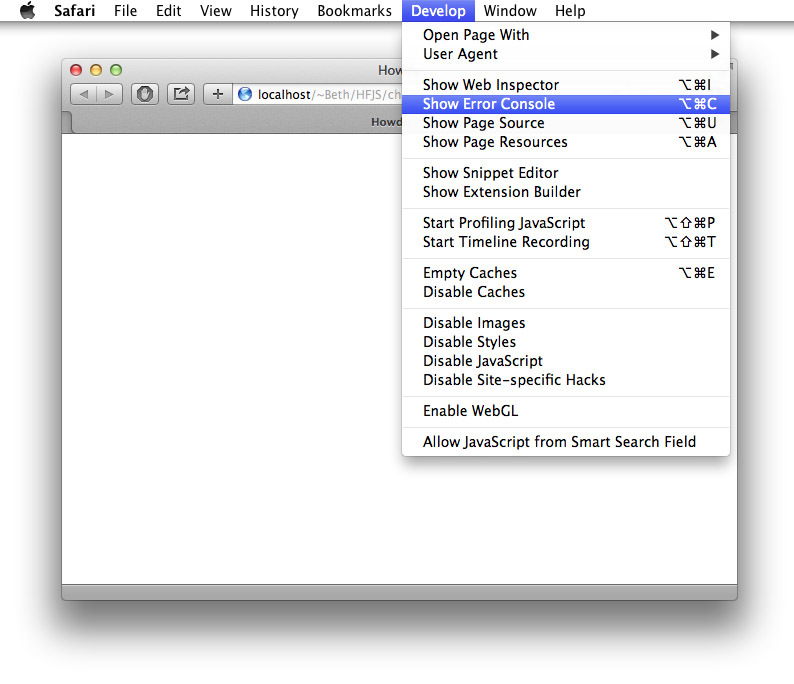 For instance, Safari version 6.1 has a very different looking console from Safari version 6. So be prepared to experiment a little if your console doesn’t look exactly like the examples below (although we’ll do our best to keep this information up to date with the most recent version of each browser). 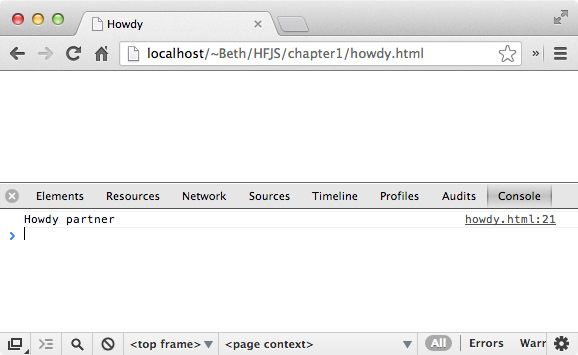 To show you how to access the console in each browser, I’m using an example from Chapter 1, in the file howdy.html. 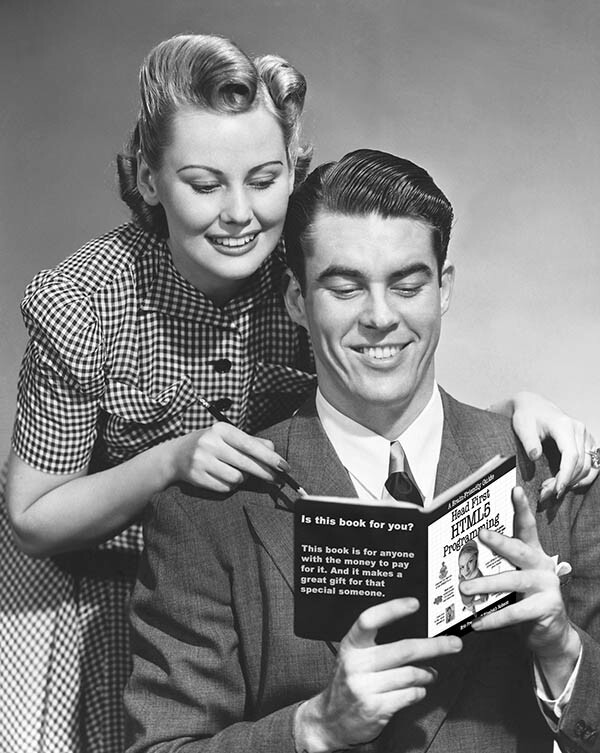 You can download all the code from github, or type the example in from the book. 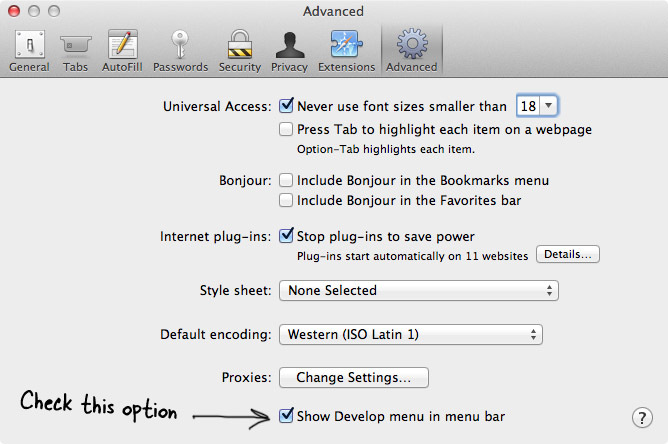 I’ll first cover browsers on the Mac, and after that, browsers on Windows. 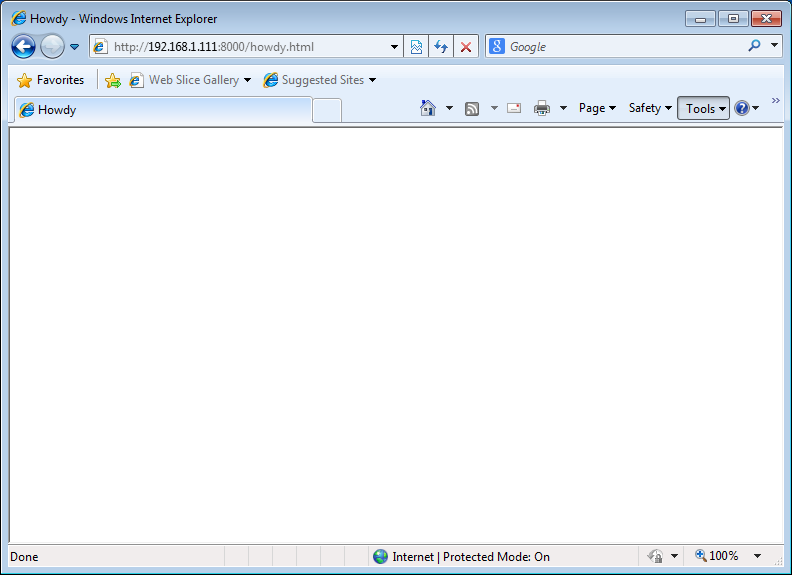 I’ll show you Chrome, Safari and Firefox on the Mac; and Chrome, Firefox and IE on Windows. 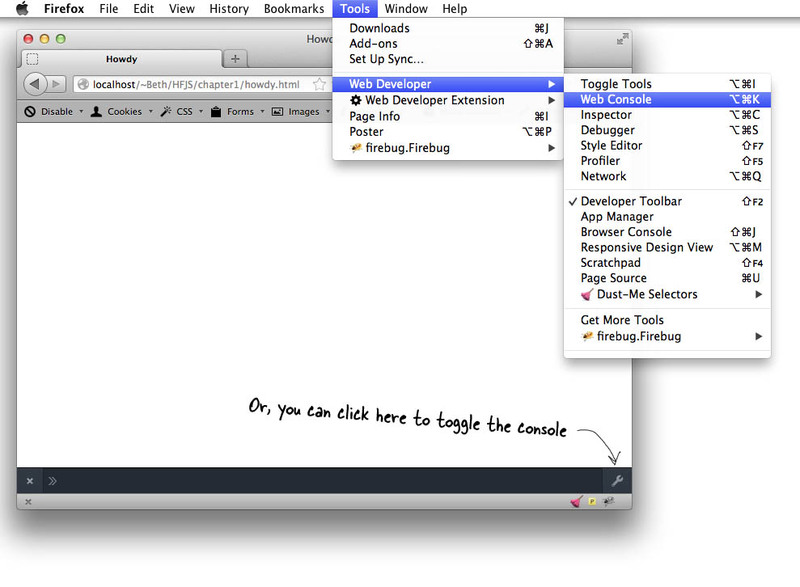 Using the Console: Two videos about using the Safari and Chrome consoles. 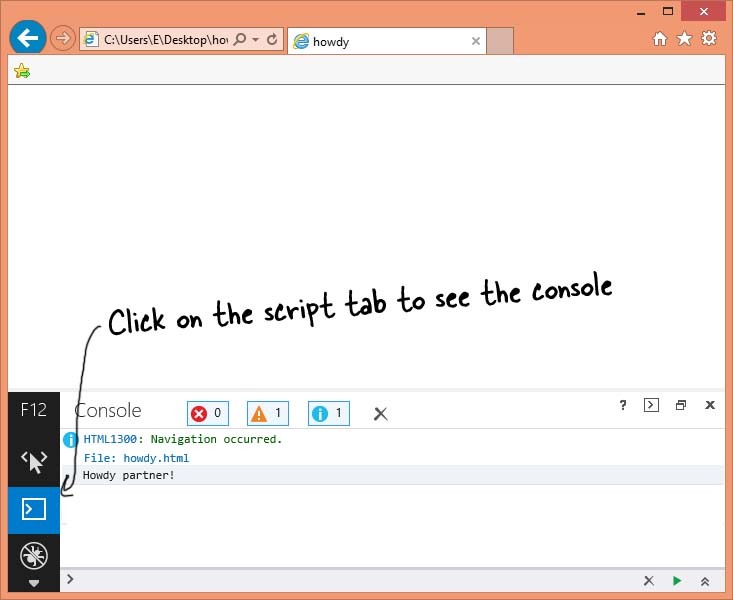 You can change the size of the console by placing your mouse over the line above the tabs (you’ll see the mouse cursor change to the sizing cursor), and moving the top of the console up or down. 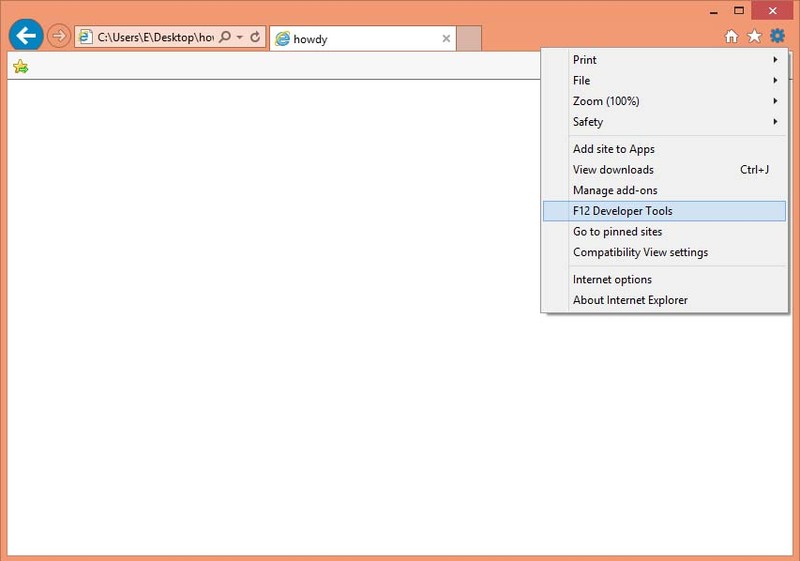 To close the console window, use the X in the top left corner of the console. This will not close your browser window, just the console. 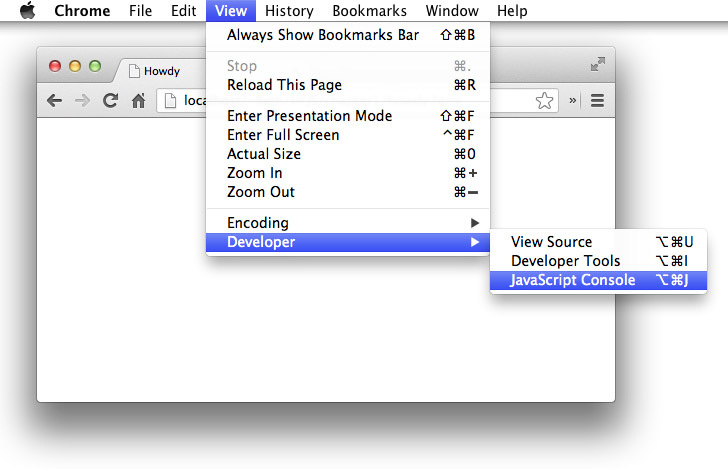 The Develop menu will appear and you’ll be able to access the Show Error Console menu item. 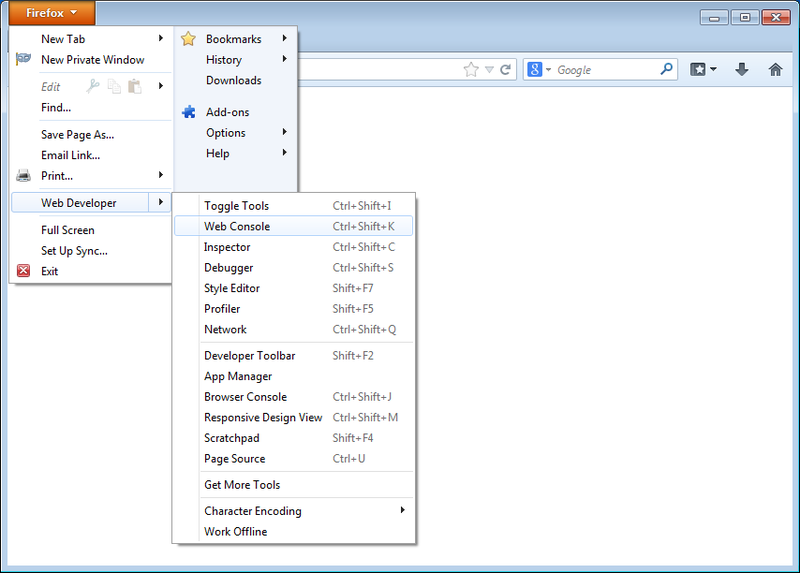 If your browser window is small when you open the console, you may see the console open into a completely separate window. 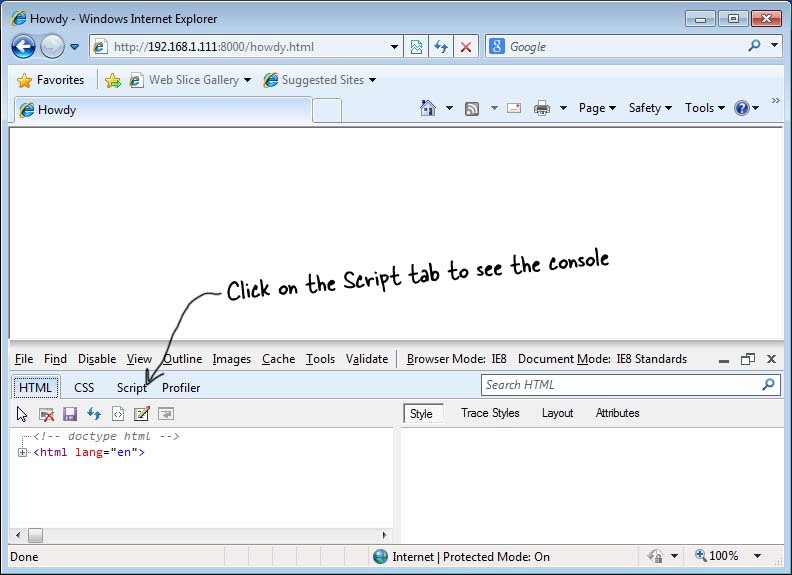 It’s fine to leave it as a separate window; however, if you want the console to appear in the same window as your page (as shown here), then try closing the console, making your browser window bigger, and then using the menu to open the console again. 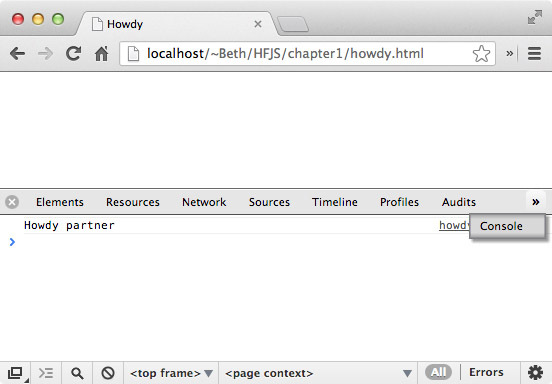 If you’ve already loaded howdy.html into the browser, you should see “Howdy partner” displayed in the console. 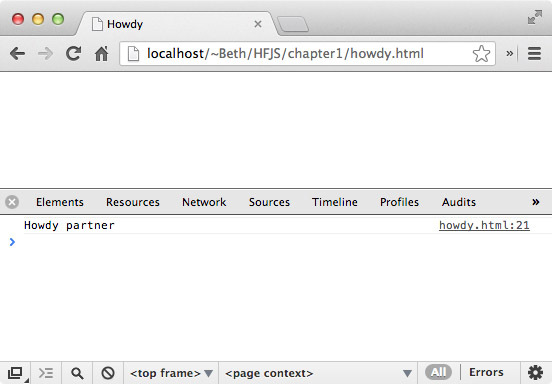 If you don’t see “Howdy partner”, go ahead and load the page (or reload it), and you should see the message appear. Notice that you have a choice of viewing “All” console messages, or just errors or log messages. Typically, you’ll want to leave “All” selected so you can see everything. You’ll see the console appear in the bottom part of your browser window (unless you have an older version of Firefox, in which case it might open in the top part of the window). You can also toggle the little wrench in the bottom right corner to show/hide the console. 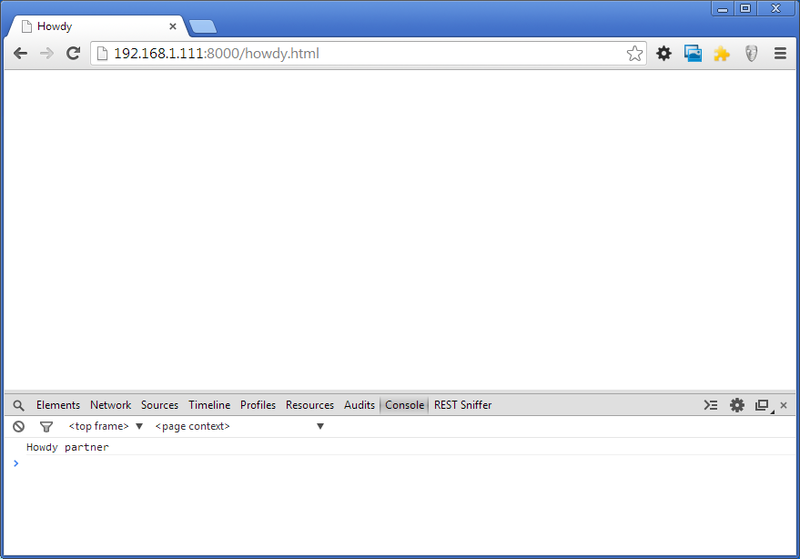 If you don’t see the console.log output, go ahead and reload the page, and then you should see “Howdy partner” displayed at the top of the console. 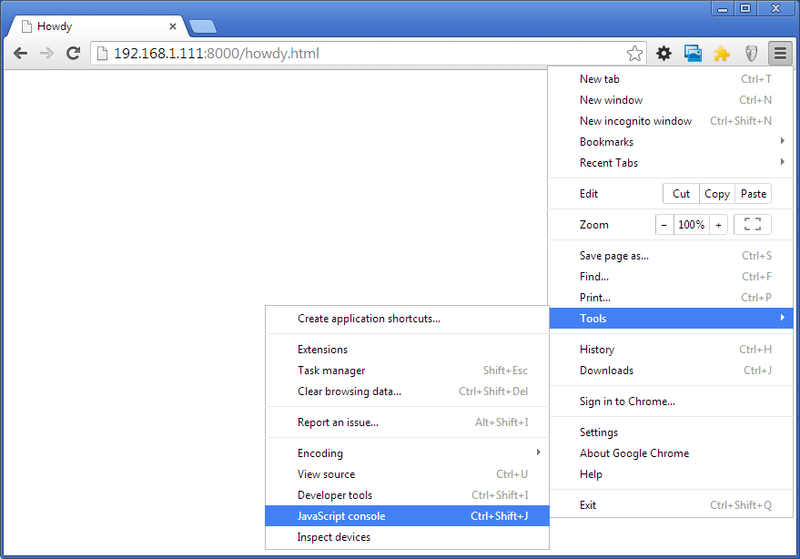 You’ll see the console appear in the bottom part of the screen, and you should see the output from the page, howdy.html, appear in the console. If you don’t, just reload the page to see it. Make sure you’ve selected the “Console” tab as shown above. 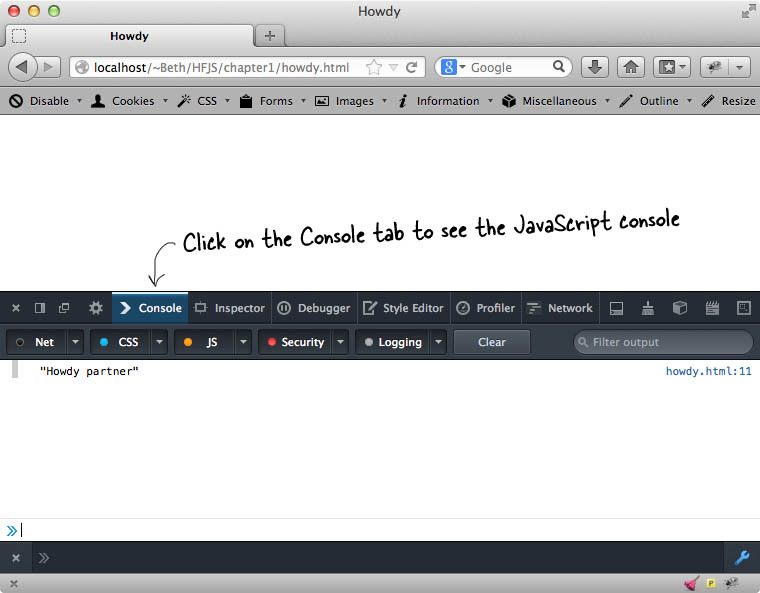 When the console opens, you should see the output from the howdy.html file in the console; if you don’t, just reload the page.